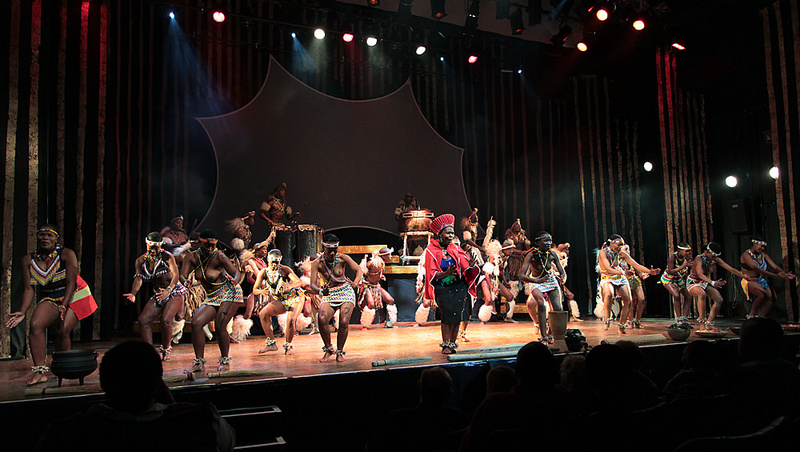 Last weekend I was invited to attend a show called ‘Umoja: The Spirit of Togetherness‘ at Joburg’s Victory Theatre in Houghton Estate. I’d heard it was a great show and had been invited more than once before, but somehow always found an excuse to miss it. I’ve now gone to the show on two consecutive Saturday nights. I can’t believe it took me so long. It’s one of this city’s best-kept secrets. 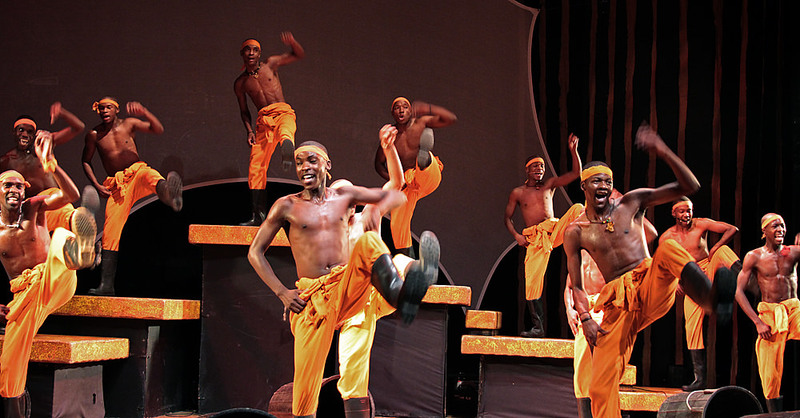 The concept of Umoja (which means ‘Unity’ in Swahili) is simple — a celebration of black South African music and dance over course of the country’s history. 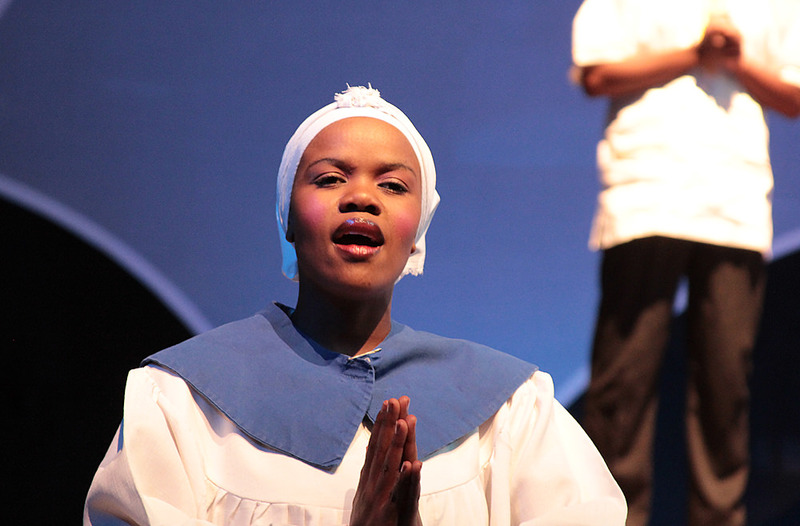 The show’s founders, veteran performers Thembi Nyandeni and Todd Twala, created Umoja as a way of empowering underprivileged kids to follow their dreams. 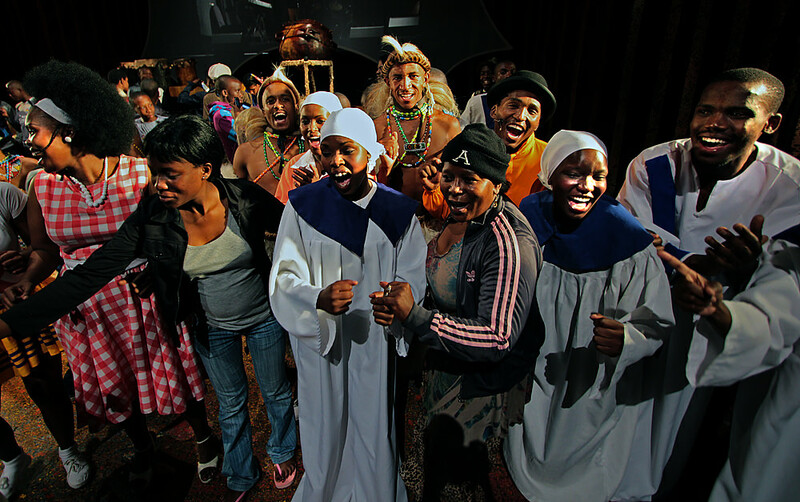 The cast members are recruited from all over South Africa; many come from rural areas and have little or no formal training. They are gifted singers, dancers, and musicians for whom music and dance are a natural part of life. African music begins and ends with the drum. So does Umoja. My first time at Umoja last Saturday night was like a religious experience. When the lights came up and the Zulu tribal dancing began, I was instantly enchanted. 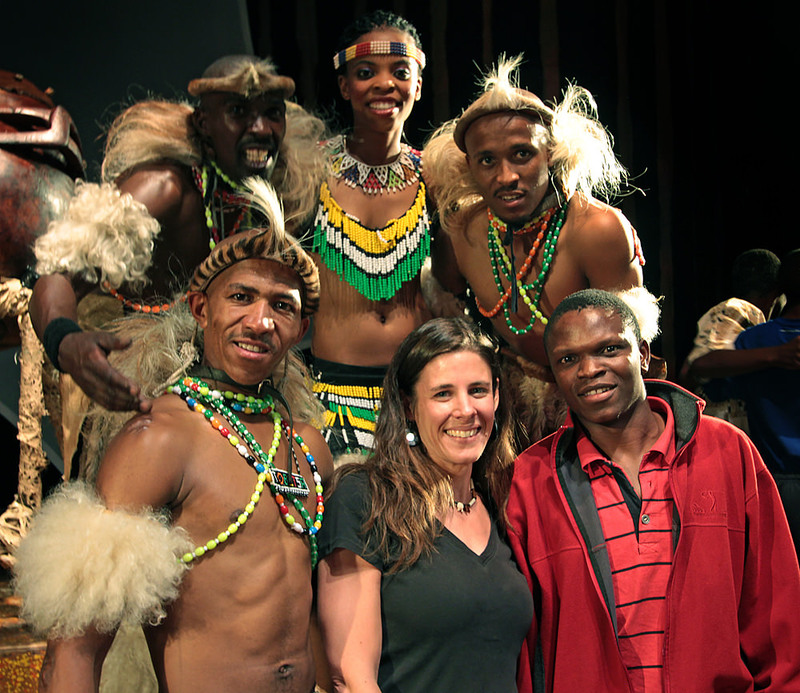 I’ve written before about my love of African singing and dancing; Zulu dance is my favorite. I’ll show you some photos but photography doesn’t do it justice. You need to be there in person to see and feel the intensity, concentration, athleticism, and pure joy that emanates from the dancers. Sorry for the blurriness and weird color but I think it conveys the energy. The most impressive part of male tribal Zulu dancing is the kicking, but I wasn’t about to put a camera in front of my face during the kicks. That would mean missing a few precious milliseconds. That first Saturday, I went to see Umoja with my friend Luthuli and his family. Luthuli’s elderly father, who is originally from Zimbabwe but lives in the UK now, is currently visiting South Africa and came along to the show. He is confined to a wheelchair and has difficulty talking. I turned to look at Luthuli’s dad partway through the show. He had tears rolling down his cheeks, and the look of happiness on his face made me burst into tears along with him. The following Saturday I went to Umoja again. I brought Horst, my landlord, and Walter, Lucky‘s brother. And this time I brought my camera. Stop snickering, boys. Bare-breasted dancing is a traditional part of Zulu culture. 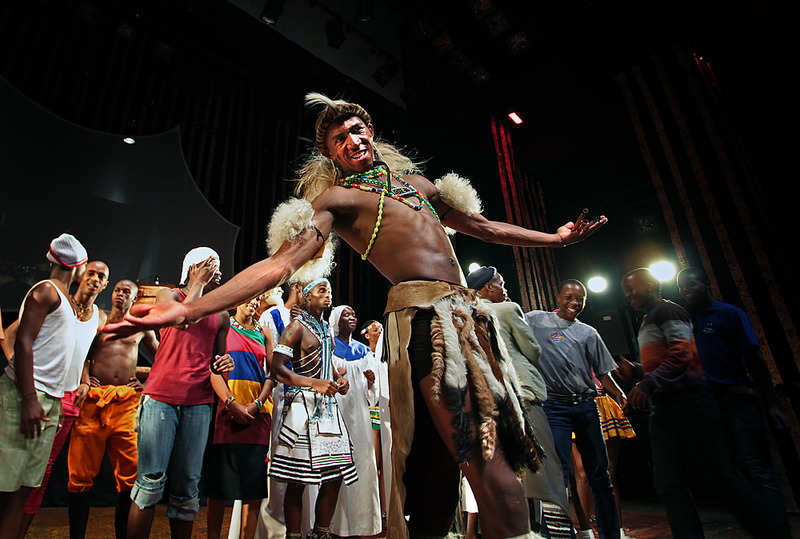 A skin-prickling dance portraying the trance of a sangoma, or traditional healer. 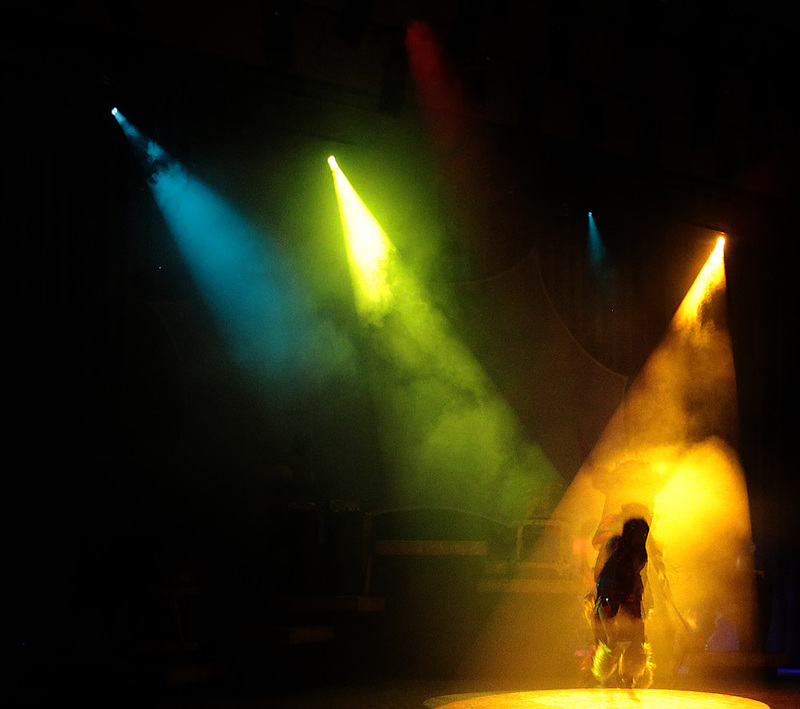 The dance is performed under multi-colored strobe lights. 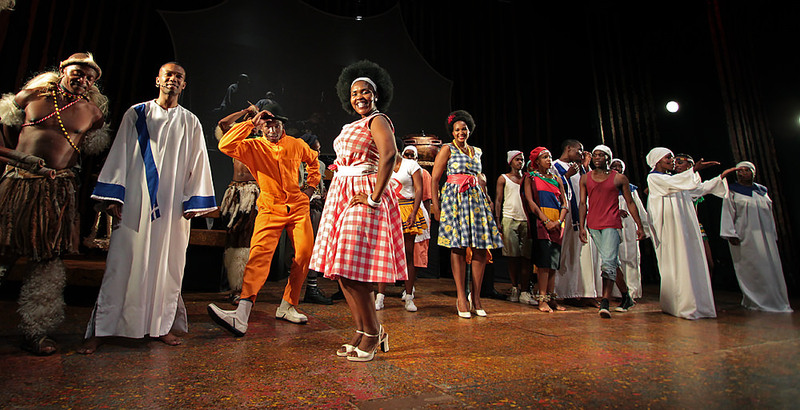 A scene depicting music and dance in mid-20th-century Johannesburg. As we walked to the lobby during intermission, I turned to Walter and asked what he thought. It was Walter’s first time at a theatre performance. Walter was smiling from ear to ear. ‘I’m still shaking!’ he exclaimed. ‘And it’s not even over yet,” I said. ‘The show is only half over,’ I told him. Walter’s smile took over his entire face. Dancing in South Africa’s mines. 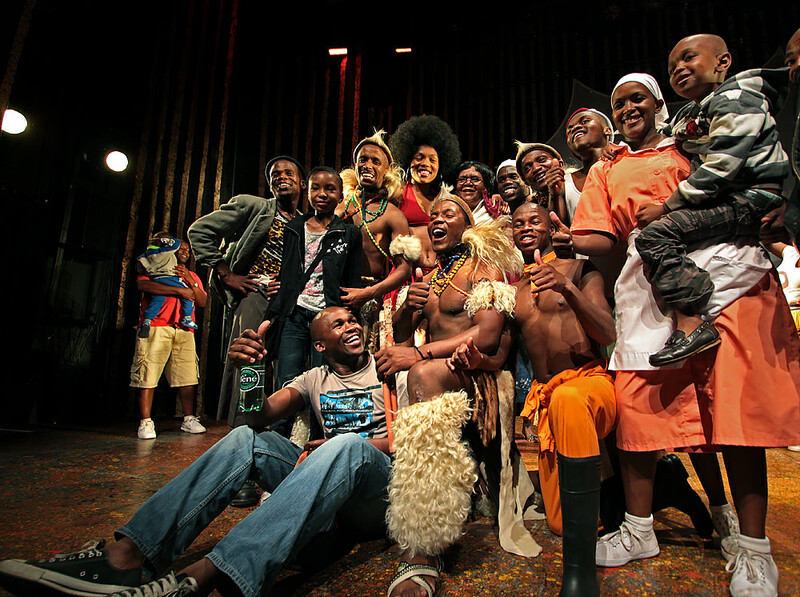 The Umoja curtain call lasts for about ten minutes. The audience doesn’t want the show to end and neither does the cast. The moment the show ended, the cast returned to the stage and invited the entire audience to come up and take pictures with them. Soon the stage was a joyful melee of teenagers, families, and cast members singing and dancing in small groups. I waded into the fray with Walter. This photo is badly composed but I love it. I did an entire photo-shoot with Walter, taking his picture with as many cast members as possible. 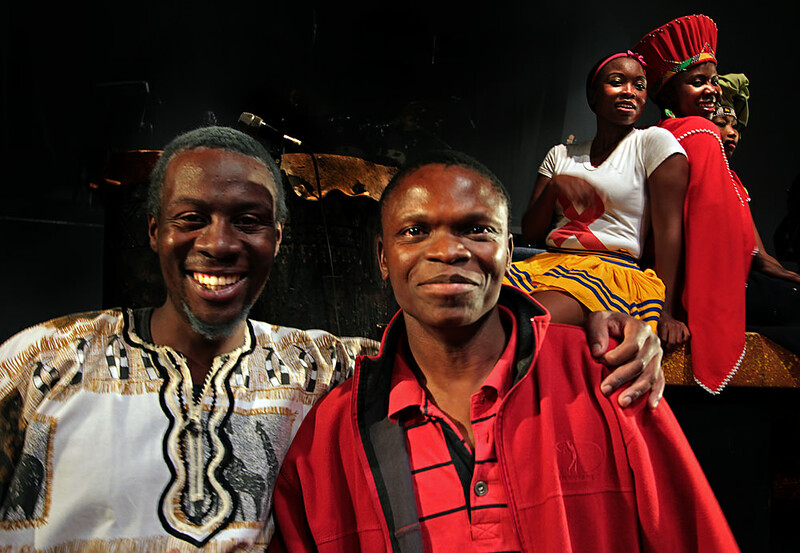 Here he is with the Umoja narrator. Lucky is SO jealous. 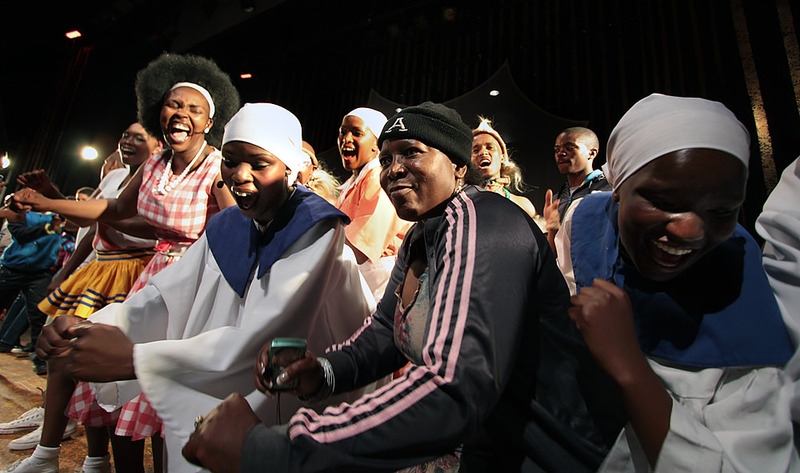 The woman in the black beanie and the Adidas jacket is Thembi Nyandeni, the show’s creator. Even though the cast had been singing and dancing their asses off for the last two hours, they were thrilled to continue performing for us indefinitely. Head buzzing, I finally climbed off the stage and chatted with Thembiso, who I believe is the show’s director. He thanked me for coming and asked if I’d enjoyed myself. I told him everything was fantastic. Tickets to Umoja cost between R80 and R200 and are available on Computicket. 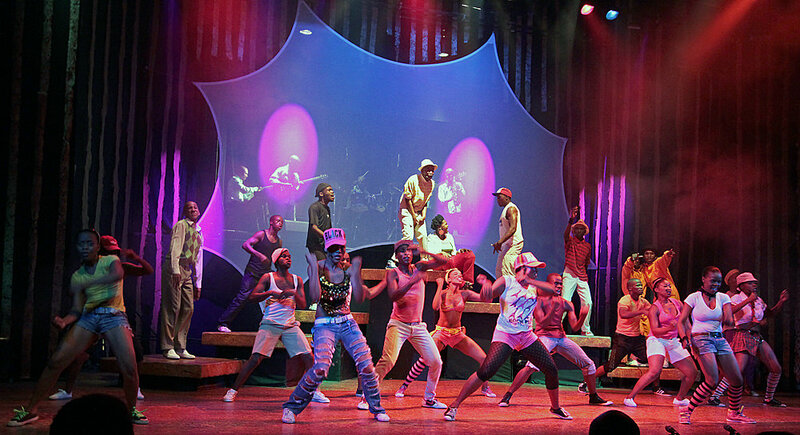 Or call the Victory Theatre at 011 728 9603. The show currently plays every Friday and Saturday. There is also a restaurant at the theatre where you can have dinner and drinks before or after the show. Thanks. I didn’t bring my camera the first time because I usually don’t feel comfortable taking pics in the theatre. But they said it was fine. (I didn’t use flash, of course.) It’s such an energetic show — an occasionally clicking shutter is hardly noticed. This looks ever so intresting, I hope I get a chance to see it. Do you know if they will tour it? Hi Conner. Yes! I should have mentioned that the show is currently touring in Europe. It’s playing in Paris now and then going to London, I think. I think it has also played in the US in the past. I’m not sure how to publicize information about it though because the Umoja website is down. Gosh – they did that for you? How awesome! I would love to experience this show. I know, it was so sweet! Just goes to show that it can’t hurt to ask for things. Excellent! I will look forward to when it comes to London. Shame that we can not take such wonderful photos like yours. It would be nice to keep a collection of these sort of things. Thanks. It comes in fits and starts. Never lasts for long but I’m learning to appreciate it while it lasts. I was thinking last night that if I could watch Umoja every night of the week I would be a much happier person! A very unique experience you rendered in photos and words to share with us. Thank you for this. Thanks Francis. I was excited to share this experience on my blog because it’s so uniquely South African. Everyone who comes here should see this show. Your photos conveyed the joy and the awesomeness of the show just perfectly! It reminded me of a little performance I watched at a hotel buffet dinner in Dar es Salam last year…..it had me mesmerised. African people really know what it takes to express themselves using their bodies. It’s utterly delightful. Haha, thanks. 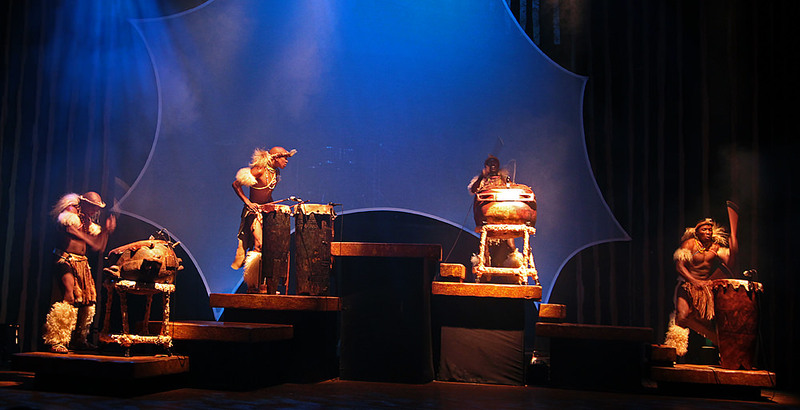 Yes, this show is similar to the kind of shows you would see at African resorts, just 100 times better! If you ever make it to Jozi, check it out. Amazing. Wish I could see the show. It looks absolutely stunning! Thanks for sharing your experience, Heather! Thank you! I don’t even know who to give credit to for that photo. It was one of a sea of Umoja cast members. Wow!! What an honor. Definitely chill producing and loved the blog and dancing. Wish I could see it too! I wish I’d known about it when you guys were here. Yes, you have to. It’s a great place to take visitors, too. Love the blog, pics and love the show. I feel like such a groupie, i love the cast and the fact that Thandie has kept this show going for all these years. Love that not only has it brought tears of happiness and joy to my eyes, but to yourself and millions of others, and continues to do so. I know i will go see it again. Any excuse will do for me. My dad, although his short term memory is poor, remembers the progression of southern African music, from the earliest days. It was indeed tear jerking, even for me, to watch him go down memory lane. Glad Walter enjoyed it, guess we’ll have to take Lucky ‘sigh’ here we go again, my seventh time. It would be totally unfair not to go with Lucky, ag! perish the thought. Next week? I’ll bet they could. Just need the right coach. @Tenny — har har. @Heather — all the dance/song performances we saw in Africa were so amazing and overwhelming — it was difficult to contain all the powerful emotions they evoked. Sometimes I would just burst into tears — as well. Hope you are hanging in there……. Thanks! You have to come back so you can see this show. I was thinking the same thing as one other post — you had a happy moment in your life. I’m happy for that. I am visiting my son & family SA for 2 weeks the end of March and April. I want to visit the place in Soweto where the dolls are made. When I get to SA, can I call you for more info about visiting the ladies? You might want to go with us! Let me know and thanks. Yes, I am definitely happy while watching this show. It’s impossible not to be! Yes, feel free to email me (I have a contact form on the blog) and I’ll send you my contact details. I’d be happy to help you arrange a visit to the shwe shww poppi place. Very nice Heather! Hey, I’m sure you remember the softball team back in the day named UMOJA!!!! Hi Dean. Yes, of course I remember UMOJA. Did you notice the comment from my dad below: “Fantastic — but can they hit? (Insiders comment)”. Haha. Hi Heather. Many many years ago I went and saw Umoja and just like you I had to go back and see it again. It is undescribable in so many ways and yet you did an amazing job of writing about it in this post. I am so glad to see that it is still going as strong as ever and I would be thrilled if it managed to come to Chile and South America one day. Thank you once again for bringing a little bit of my home to me as I sit on the other end of the world. Hi Ingrid. I’m glad you enjoyed both the show and the blog post. Fingers crossed that Umoja makes it over to you someday. Thanks DarkJade. I’ll check it out! Thanks Fidel. I think the secret is my Canon 60D with a 10-22 mm lens. I have no idea why, but that combination works so well in low light conditions. Wide-open aperture, 2000 ISO, and there you have it. I was shocked myself at how nice the pics turned out. I expected to make do with one or two blurry/grainy shots, but I got so much more!